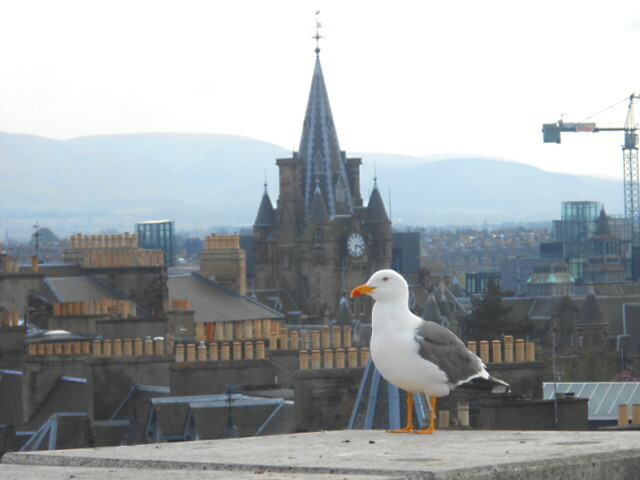 EDINBURGH—A seagull enjoys a perch on the observation deck at the National Museum in downtown Edinburgh, Scotland. He is looking out over chimney pots, church steeples, new construction cranes and the Pentland Hills in the distance. The seasons lag a little behind in Champion’s Sister-City, Edinburgh. The countless cherry trees are just coming into their pink and white near perfection out on The Meadows. It is reported that the dogwoods and redbuds are glorious out on CR 234 and 243, on Cold Springs and Fox Creek Roads. Most likely the little blue and purple wildflowers are lining the roads there now with mushroom and turkey surprises around every turn. So it is in Scotia’s fair city. Around every turn is a new wonder, a delight, a mystery or a startling piece of history. New friends say that it is blistering hot in the south of Spain now while a warm raincoat is still the order of the day on the wide, wild and wooly banks of the Fourth River. Severe weather reports for the Ozarks reach across the broad Atlantic and hopes are that the hail and wind will leave a few blossoms for returning Champions to enjoy. The best hopes are for the safety of all the friends, family members and their dear ones in the area. While power outages are making things difficult in parts of Douglas County, some not too far away are having a much harder time of it and Champions everywhere wish them well. May Day is a familiar celebration in the United States though it is not as popular as it is in other parts of the world where it has been used to organize and recognize labor (Workers of the World Unite!) and political groups as well. The ancient Druids of the British Isles divided the year into halves marked by May 1st–Beltane, and November 1st–Samhain. The May Day custom in the old days was the setting of new fire. It was one of those ancient New Year rites performed throughout the world. The fire itself was thought to lend life to the burgeoning springtime sun. Cattle were driven through the fire to purify them. Men, with their sweethearts, passed through the smoke for good luck. Up on Calton Hill, surrounded by the great city, on Wednesday night the fire will be extinguished ceremoniously and rekindled. Blue painted people will be drumming and singing and carrying their torches. Up on Arthur’s Seat sweethearts celebrate in the usual ways. The dew of May Day is thought to have powers of rejuvenation and ladies wash their faces in it to maintain their youth. The May Day dew up on Mount Champion certainly could do no harm. At the very least some faces could get a layer of grime removed. There seems to be no holiday for washing the back of the neck. Linda’s Almanac from up at The Plant Place in Norwood says that the 3rd through the 5th will be favorable for planting beans, corn, cotton, okra, peppers, eggplant and other above-ground crops. The 6th to the 10th will be barren days during which time any number of chores can be finished up around the place. The 8th, 9th, and 10th are all good days to prune to discourage growth. That means weeding and lawn mowing too. There is never a shortage of work to do around the farm. If a person lays off for a while and does not get much done he can be sure that it will be waiting for him. People who are waiting for someone to come along to help out better just plod along and accomplish what they can. Help is probably not on the way. Lem and Ned may have their own gardens to make. Meanwhile, over at Skyline the first graders are enjoying watching their turkey eggs hatch. Young farmers are learning about nature. Champion! One of the nice things about Tuesdays is that Laine Sutherland’s videos of the McClurg Jam show up on the internet. It is sweet to see familiar faces and to hear Ragtime Annie and all those other great tunes. Music is a marvelous glue holding peoples, their culture and traditions together and it is one of the best ways to share those things with others. Alvie Dooms is legendary now in Auld Reeke, Edina, the Athens of the North, for having put the family fiddle back into play. Generations to come will enjoy its bright clear tone. It will stand alone and will join in harmony with other instruments to thrill, delight, comfort and soothe, as music is a great healer. The Flowers of Edinburg, The Westphalia Waltz and many dozens of other tunes will be given their lovely due. Thank you, Mr. Dooms. No place on Earth is significantly older than any other place. No place is significantly nearer or farther from the center of the Earth than any other, or significantly closer to the sun. Every place has history that goes all the way back. Some places do, however, seem to have more of it written down and remembered. The reason for remembering is to avoid making the same mistakes again and again. A new acquaintance remarked the other day that no amount of guilt can solve the past and no amount of anxiety can change the future. He said in an r rolling brogue, “A lot of bad things are going to happen to you. First off, you’re ‘gain to dee.’ So, that said, there’s not much to worry about…No matter what else happens, you have only two options: you can either handle things well and be happy, or you can handle them poorly and be miserable.” He sounds like he would fit in pretty well out on the Veranda of the Historic Emporium over on the North Side of the Square. A person would be able to tell right off that he is from the great elsewhere on account of his accent and his clothes, but Fearghas would feel at home and enjoy the hospitality and the novelty of being in another of the world’s truly beautiful places—Champion! Looking on the Bright Side! Seeing the sights in Champion could take just a few minutes, all day, or a life-time depending upon the way a body goes about it. Robert Louis Stevenson said that the journey is better than the arrival. The journey is full of optimism and these days Champion is all about optimism. First there were mushrooms, now there are hummingbirds, and now some people are topping off the refrigerant in their air conditioners. Linda says potato planting is still good on the 24th and 25th. Add the glorious flowering trees and shrubs to this list and the ‘spring-deniers’ are sure to be enlightened. Get Linda’s Almanac at The Plant Place in Norwood, look at it on the bulletin board at Henson’s Downtown G&G or look at the top of the page at www.championnews.us. Get out and enjoy spring like the birders do. A bunch of them including Mary Beth and Clark Shannon, Janet and Sandy Chapin, Paul Clark, Carol Tharp, Shelby Squirrel, Rick Brischetto and a number of others took a birding trip to Welch Springs, Devil’s Well (sinkhole), the Current River State Park and Round Spring. Reports are that they saw 58 bird species, including a bald eagle, a red shouldered hawk on nest, a black vulture on nest in a pocket on the cliff wall, and a lone coot on the lake at the state park. It sounds like a wonderful adventure and certainly the pictures on the internet were of some smiling people doing what they enjoy–Champions. News out of Denlow indicates that Wayne Anderson was quite the hero during the Denlow Cemetery spring-cleaning last week. Working on the theory that the absence of anything bad is indeed the same as something good, he maneuvered his mowing machine with deft accuracy and made short work of the task at hand, knocking over no walls or monuments, and going through no fences or down any steep grades to the highway. Bravo! (Thank you, General, for the report.) Wayne has kinfolks in Scotland whom he has yet to meet. One could very well be Nicola Anderson. She is the only woman gardener on the Princes Street Garden staff. After taking her degree twenty-seven years ago, she worked her way up into various high profile gardens in sports stadiums and for some while with the Glasgow municipality. She has been in the Royal Gardens here in Edinburgh for six years now. At the Gardener’s Cottage she took time from applying bone meal to the roses to open a gardening book to identify for passers by the “Fritillaria—frillary.” It is an Alpine bulb with a striking configuration. It is to be divided every four years and must be kept in certain conditions when it is out of the ground owing to its unpleasant odor. Nicola comes from an academic family. Her mother is a pediatrician and her father a world renowned professor of languages. He speaks fifteen languages, some ancient, and writes comparative texts. He lives in Rome. Her sisters are both in Edinburgh—one a professor of English at The University and the other, a noted psychologist. Nicola says that of the bunch she is the happy one–working outside and seeing things grow. She is planning a trip to the States in a couple of years looking to go to New England and New Orleans. Champion would be a good stopover in between where she could become acquainted with some other charming Andersons. The quaint Gardener’s Cottage looks very much like the cottage that Taegan Krider received as an early birthday present. She will probably plant some flowers around it. Taegan is in prekindergarten at Skyline. Other students enjoying their birthday soon will be Haley Wilson, a fifth grader, celebrating on the 23rd. Kindergartener Shelby Wilson has hers on the 24th. Eli Johnson is also in pre-kindergarten and his birthday is on the 28th. Isaam Creed is in the fourth grade and has the 29th for his birthday. Taegan shares her birthday with Ryan Sandberg a seventh grader on the 30th. Chante Michaud visits Champion occasionally on a Sunday. She is about ten now and has her birthday on the 27th. To back up a little bit, Ms. Myrtle Harris had her 85th birthday on April 17th. She has a much younger sister named Kathy, and they are both big fans of the bluegrass and can be found most Thursday evenings over at Vanzant. A new friend has promised to sing a song for her there one day. It is novelty song from the 1950’s that says, “I took my gal to the picture show. She promised me a kiss when we got home. To take her in my arms I just couldn’t wait, but when we got home her pappy was awake. ‘Is that your, Myrtle?’ ‘Yes, Papa.’ ‘Is that you, Myrtle?’ ‘Well just a minute!’ ‘Is that you, Myrtle? Is that you, Myrtle? I guess you better send that scalawag home! I guess you better send that scalawag home!’” The song goes on with other verses but the outcome is the same—the scalawag has to go home. All the live music in the big city reminds a wanderer of her country home. J.C. Owsley has a big white mule on loan from some good friend. He claims that in his younger cowboy days common sense took a back seat to excitement. ‘Dot’ is a large mule—large enough to make J.C. look like an ordinary size person. It’s only when you are inside a building with him that you realize that he must be going on seven foot tall. Anyway, with good luck he will trailer Dot down to Champion from Cross Timbers for one of the trail rides or wagon train outings. Diane Wilbanks has shared the Schedule of Rides of the West Plains Wagon Club. She said that there would be a plowing event down in Arkansas during April and then April 28th-May 3rd Jim and Judy Cantrell of Mansfield will host a ride. For more information about it call 417—924-3702. Bud Hutchison’s Spring trail ride is set for May 7th. They will take out of Champion and go somewhere and then come back. For more information call Bud at 683-4864. Good fortune sometimes puts people together with friends in high places. These friends actually had tickets to the high places which happened to be for the Public Astronomy Evening at the Royal Observatory. It is atop Blackford Hill in the south east part of the city where it has been since 1896. Three miles away, its previous location on Calton Hill is now called The City Observatory. It was established there in 1785 by The University of Edinburgh and moved when the city lights and smog became an impediment. The air has been cleaned up since homes are no longer heated with coal, and though the light pollution is an issue, the work goes on. A tall, handsome young Dutchman, an astronomer, gave a lecture and Power Point demonstration of the night skies identifying the constellations that can be seen in the Northern hemisphere. A lovely young Glaswegian (from Glasgow), an astrophysicist, spoke of the nature of heavenly bodies and their composition. She had small chunks of meteorites to examine. They are the oldest things around, she said. The tour included a close up look at the 30” telescope that was put in place in 1926, together with the ingenious workings of the great copper domes that rotate and open. This part of the tour was conducted by a gentleman named Randall Scot who led the group up the 90 steps to the dome where he explained how starlight is reflected in the 30” mirror, then how it is reduced, concentrated, and spectrographed to make it visible. It is eye opening to consider the technology of the day when he first entered the field of astronomy and that of today. He has kept up with it and is every bit as excited about it as when he first began. On May 24th he will celebrate fifty years of employment at The Royal Observatory. Those 90 steps daily have kept the gentleman spry. Star gazing has kept him smiling. Come to down to the bottom of several hills, where country lanes meet and the pavement ends (or begins) on the wide, wild and wooly banks of Old Fox Creek. Sit out on the spacious veranda and enjoy one of the world’s truly beautiful places—Champion—Looking on the Bright Side! Travelers coming into Champion from distant places are met with hospitality and veiled curiosity. One does not wish to be nosy or rude but it is interesting to know what brings a wanderer through the village. It is a tribute to a beautiful place and good people that someone from the great outside can be so easily enticed to stay a while. “Out goers and in comers made, make every land.” These words appear on a tapestry which was taken from a design by Alasdair Gray. The tapestry is a square about seven feet to the side. It features thistles (the National flower) at every corner and in the center with arrows going in and out signifying lands and nations. It is actually a ‘gun tufted’ rug tufted at Dovecot Studios by a gentleman named Jonathan Cleaver. The studio is housed in the building that was the first heated indoor swimming pool in Edinburgh back in the time of Queen Victoria. The pool has been covered over by a gleaming floor where the massive wooden looms stand. The Weaving Floor Viewing Balcony is open to the public to view the weaving studio below. Go to www.dovecotstudios.com for an amazing virtual tour. It is easy to ‘google up’ Alasdair Gray as well. The world seems to be quite at one’s fingertips now days. It is sure that old Champion out goers will be happy incomers once more just as the Upshaws came home again to roost after their great family visit to Dalton, Arkansas. The General said, “I went on a trip today to Dalton, Arkansas (first time farther than eight miles from home in many moons). A hand written sign taped to a window at the only business in town, ‘FREE to a good home, speckled roosters. Do Not Eat.’ I lost interest in the bargain after reading the last three words.” Highlights of the clan adventure were The Grand Canyon and the Rice-Upshaw Homestead. The Rice-Upshaw House was added to the National Register of Historic Places in 2004 as an excellent example of an early nineteenth century log dwelling. It was built in 1826 and is now the oldest standing building remaining in Arkansas, and a rare surviving example of a building from Arkansas’s territorial period. Reuben Rice came to Arkansas from Hawkins County , Tennessee, in 1812. His granddaughter Lydia married Andrew Jackson Upshaw and continued to live in the home which had become known as “Old Monarch.” The house, owned by Rice and Upshaw family members for almost 180 years, was donated to the Black River Technical College. The home has been restored and is open for tours by appointment. This trip was clearly well planed and the Upshaws all looked like they were having a wonderful time. Some of that might just be that they really enjoy each other’s company. Dylan Watts would have had a good time on that family jaunt. He is over in Tennessee where they all came from to start with and when he is not motocross mud jumping motorcycles he is picking the banjo in with a bunch of guitar playing cousins. He just had his birthday on the 12 of April and it is a fairly sure bet that he had a good time. Bob Berry celebrates his birthday on the 14th of April. Champions miss him and Mary Goolsby of in their new situation. It would sure be nice to see them pulling into Champion in the beautiful old Studebaker again. Maybe summer travels will find them coming ‘home’ again. Champions would like that. Bob shares his day with Skyline first grader Coby Wallace and with 7th grader Morgan Whitacre. Prekindergarten student Wyatt Lakey has his birthday on April 15th so people will always be able to remember that something special is going on that day. Dusty Mike might be out on the road on his special birthday, the 15th. Drayson will be glad to see his old Papa when he makes it home. Vivian Krider Floyd will be enjoying her birthday that day too. Cards and phone calls and cyber messages from family and friends will let her know that she is much loved. Then the inimitable George G. Jones over in Stockton can stroll by the mirror and figure he is still looking pretty good all things considered. Olivia Trig Mastin will have her birthday on the 16th. She lives up in Springfield near her grandmother and is therefore a lucky young lady. Toby Marceaux is in the 8th grade at Skyline. His birthday is on the 17th so he might get to do a little partying in school. Next week a whole new group of preschoolers can get their start at Skyline. Helen says that preschool screenings will be held during the week of April 21-25. She says to make an appointment with the office and bring birth certificates, shot records, social security number and proof of residency. It is a real asset to the community to have this wonderful little school getting the future voters, doctors, farmers, musicians and adventurers off to a good start. Champions all! Linda says that people are not quite ready to get their gardens in since there is another hard freeze on the way and the possibility of more before the weather gets really settled for Spring. She has been selling lots of hostas and peonies and perennials of that nature. Her cole crops and other vegetables and flowers are coming along nicely. Her Almanac says that the 16th and 17th will be good days for planting beets, carrots, radishes, turnips, peanuts and other root crops. Also good for cabbage, cauliflower, lettuce, kale, celery, and other leafy vegetables. They will be good days for starting seedbeds and for transplanting. Get a copy of the Almanac there at The Plant Place in Norwood or consult it on the bulletin board at Henson’s Downtown G & G or on the website at www.championnews.us. Over in Edinburgh Champions have been busy enjoying the National Gallery where there are real Rembrants, Van Goughs and Reubens. They have seen some of the many treasures of the National Museum and have climbed almost to the top of the extinct volcano that is Arthur’s Seat in the middle of town. They have seen great tapestries in the making and bird sanctuaries and narrow mysterious streets winding up and down steep hills. And music! Bluegrass is as sweet in Edinburgh as it is in Vanzant or McClurg. A monthly gathering at the Revarie finds friends meeting who have been playing together for thirty years. Gordon is a guitar virtuoso, also a fine fiddler and autoharp enthusiast. Bill plays banjo but his main instrument is the dobro. Graham plays a fiddle, a guitar, or a mandolin all of which he made from a single salvaged slab of American black walnut when an old bank building was being refurbished. Ian is a banjo expert. He is playful and generous and brilliant. How lovely it would be to get him and Wayne Anderson together! The young bass player never misses this jam session and on this particular Friday the group was enhanced by a young Englishman carrying the Gibson mandolin he inherited from his great grandfather and a little Romanian guitar with its face scarred from his rowdy and passionate playing. Add then a lovely young Canadian lady with her cello. When it was her turn to kick off a tune she went for “Ode to Joy” which all the fellows joined in with great enthusiasm and somewhere along the line let it morph into “Yankee Doodle” then back again with all the lovely smiles and camaraderie that musicians are known for. The world over they seem to be looking at the bottom of the clouds when they are searching for a melody or a lyric. What ever may be the object of your search, if it is pleasant and convivial it is likely to be found in Champion—Looking on the Bright Side! One of the marvelous aspects of travel is the opportunity to compare the known with the unknown. Busy streets, old and cobbled, have large numbers of people walking quickly toward you and rapidly approaching footsteps behind you and cars whizzing by closely from unexpected directions down long canyons of four and five story buildings with the sounds echoing and bouncing off the walls. A country person, used to the quiet, might take some time to become accustomed to the swift pace of life. Though it is ever so much more tranquil, even on the broad and beautiful banks of Old Fox Creek life seems to be whizzing away quickly for folks who see how little there is of it left to waste. Champions live it as it happens. J.C. Owlsey has a fifty year old son! Jesse just had his birthday and now J.C. says he can no longer tell his friends that he is only 59. He is young at heart and, after a certain point, that is all that counts. Raylee and Rylee are twins who have just celebrated their first birthday. They have Buzz and Sharon for grandparents so they are already geared for fun and excitement. Most likely they will be musical as well since they have it sprinkled so liberally through their family. Dylan Watts has changed his profile picture on Facebook to reflect his love of fishing. He is holding up a couple of nice looking crappie and has a grin on his face that is now the confident grin of a young man. It seems like yesterday that he was three years old and on the stage with his Granddad at the Skyline Picnic singing “I’ll Fly Away.” Now he is picking the banjo in a way that would satisfy his Granddad that the gift has been passed on. Sherry Bennett and Laine Sutherland keep local jam sessions and news of what is going on in the music community posted on the internet for the benefit of the wayside wanderer. Probably every place in the world has its own version of the Historic Emporium on the North Side of the Square in Downtown Champion. One such place is called The Royal Oak where people gather to visit, to tell stories and to hear music and to take their dreuth. A great story teller and music appreciator is Ms. Violet Piago. She is in her early eighties and has retired back to her hometown of Edinburgh (Edinburra) after having had an exciting life working all over the world. Most of her career was in the waxworks. Many have heard of Madam Tussaud’s Wax Museum which is exclusive to London. Violet worked for a competing firm that serves museums and entertainment venues from Australia to Canada and every which way. Her specialty is hair. One strand at a time, she gave Elvis his coiffure. She is a funny, generous and kind lady with a mischievous twinkle in her eye and a clear vision to see right to the heart of a matter—whatever the matter may be. “There’s nothing new under the sun,” quoted she. Great news has come from Tim Scrivner about the Skyline RII School Foundation. “On the subject of the DPIL (Dolly Parton Imagination Library), so far we have provided a total of 707 books for our local preschoolers with 28 currently receiving monthly books and 13 who have graduated the program.” Anyone in Douglas County with a child new-born to five years of age can sign up to get a new, age-appropriate book sent to the child each month at no cost to the family. Everyone is eligible regardless of income or any other consideration. Find applications at the Skyline School or at Henson’s Grocery & Gas in Downtown Champion. There will be another meeting of the Foundation before school is out. Look for an announcement to that effect and consider attending. Meetings are open to the public. Among the ideas currently being considered for the Foundation in the future is possibly replacing the drinking fountains in the school. Any idea that would serve the children, particularly in the academics, is most welcome. Any inventive ideas for fund raising would also be appreciated. Watch for the meeting date or email your idea to Champion @ championnews.us, Attention: Skyline R2 School Foundation. Lannie Hinote has been fishing too. She takes her camera with her to prove her catches to some competitive fishermen friends. She has been shepherding students through science at Skyline for a long time and has stirred some exciting successes. The Douglas County Museum and Historical Society has posted a great picture of the Black Oak Flat School. The picture was made in 1956, and must have been some time in the winter because the kids were all bundled up. There were about 25 of them. That was the last year before the schools were consolidated into Skyline. It was over in the Boone Township north east of the Crystal Lake Fisheries. Eighth grade students in 1956 may have had a more thorough education than kids get today. Perhaps that is true or just that they really had to know how to multiply and divide and find the square root. Technology has changed things. Carl Sagan, a great American scientist died seventeen years ago. He said then that we have arranged a society based on science and technology in which nobody knows anything about science and technology. He said that it is this combustible mixture of ignorance and power that sooner or later will blow up in our faces. He asked who is running the science and technology in a democracy if the people don’t know anything about science, or technology, or democracy. He said science is more than a body of knowledge. It is a way of thinking, a way of skeptically interrogating the universe with a fine understanding of human fallibility. If we are not able to ask skeptical questions of people who tell us what is true, to be skeptical of those in authority, then we are up a creek and vulnerable to the next charlatan—political or religious—who comes along. It is something that Thomas Jefferson placed great stress on. Jefferson figured that it was not enough that we enshrine some rights in the Constitution or the Bill of Rights; the people had to be educated and to practice their skepticism and their education. Otherwise we do not run the government. The government runs us. Deep Champion thoughts like these may be discussed at will around the round table in the conversation conservatory at the Champion Store. Check it out. Things are burgeoning and blooming and budding on both sides of the wide Atlantic. It is striking to observe the great similarities in topography and the springing season. People are planting and are therefore optimistic. As the deadline has passed, all hope of any news from Vanzant has vanished. The ‘stringer’ must have misunderstood the nature of the position and has gone fishing. It is pretty well figured that Wednesday will have a mid-day caucus of cleverness in Champion and the Thursday evening will be potluck and bluegrass in Vanzant. Friday is bluegrass night in Edinburgh so excitement is building on either end of a 4,134 mile string. Tune that string to “C” for Champion—Looking on the Bright Side! It would seem that people have finally worn themselves out with complaining about the weather. They have whined and moaned since three days before Thanksgiving (according to Elmer) and have just about used up every applicable lament. They ran out of gripes just in time. The days are glorious in Champion. Raymond and Esther Howard were in town last week. They live over in Marshfield but get down to Champion on a Sunday every now and then. Raymond has just bought a new truck. It is a used truck, but just used by a little old lady to do her grocery shopping since she bought it new in 1999. It is a hot little Ford and redder than red with some fancy accent painting on the doors and tail gate. It is pristine and it has a standard transmission and a wild man behind the wheel. Nineteen or ninety one? Esther says he is enjoying his ‘toy.’ He delivers Meals on Wheels in his neighborhood and has a chrome plated tool box in the truck bed that works well for the purpose. Raymond is a good driver and a good neighbor. Friends were talking about Neil Schudy the other night. Miley Schober’s grandmother says that Neil was about the best neighbor a person could have. He would help you do anything. If you were broke down in the hay field or had some fence down he was right there to help. She said that the kids (meaning Miley’s Mom and folks of that generation) all loved Neil. He was a big kid himself and loved to play tag on the road with the kids on the four wheelers and to ride horses and rope and do all that cowboy stuff. He particularly liked paint horses and he said that he spent most of his time on a horse and the rest of the time was just wasted. He and his sweet smile are sorely missed. The family of Russell Upshaw gathered at Denlow on Sunday to give him a send-off. Another celebration of his life will happen about April 27th. Details have not yet been finalized, but every Vanzant bluegrass jam will be a celebration of Russell and Sue. The Wellness Night up at Skyline last week was a great event. Jenna and Jacob Brixey were romping with their Champion chums being rowdy and noisy and having a wonderful time. Taegan Krider was right in there with them doing some very exciting activities with parachutes and bouncing balls. Her Dad said she did not want to leave. The Skyline students will have Muffins with Mom on April 4th. That afternoon at 2:00 they will have the BACA (Bikers Against Child Abuse) assembly. On Sunday the 6th students and their families are being encouraged to wear blue as a way to promote child abuse awareness. This little school is doing a terrific job of taking care of the future movers and shakers of the area. You never can tell what these great kids are going to do. Judson Wall was the Valedictorian of Skyline School in 2001. He went from one good school to another and is now a respected attorney who has announced his intentions to seek the office of associate circuit judge in Douglas County. Elizabeth Bock currently holds that office. She made a big impression at the Skyline VFD Chili Supper visiting and bidding in a big supportive way on silent auction items. The primary election will be in August, so there will be some time to get acquainted with all the candidates for public office. How exciting to be part of the electorate! Champion! It all gets started in school. The Dolly Parton Imagination Library gets them ready to read and kindergarten takes over from there. “Good, better, best—never let it rest—‘till your good is better and your better is best!” That is a real Champion notion taught to the esteemed musician, Bobby Nicholson, in 1976, when he was just a lad in another quality little school up in Kircaldy, Scotland. It is about the size of Skyline in a town about the size of Norwood. One of Bobbie’s good friends, Morag Edward, will be having her birthday on March 31st. There will be music and chocolate and much good merriment. Meanwhile, back in Champion, Teagan’s year old Blue Healer, Banjo, is going to stock dog school. He started off being afraid of the sheep and then decided he might like to eat one. He about has it figured out now and it looks like he is going to be a big help on the farm. Champion’s other friend Linda is up at The Plant Place in Norwood busy transplanting tiny plants from her seed starting station into the four-packs of flowers and vegetables that will make Champion gardens lush and lovely this summer. Gardeners with the time, space and know-how can get seeds started for above the ground crops on the first and second and then on the sixth and seventh of April. Linda’s Almanac says that the third through the fifth will be barren days. She says her Cole crops are looking good. Get a good look at that almanac there at The Plant Place and on the bulletin board at Henson’s Downtown Grocery & Gas and at the very top of the page at www.championnews.us. Bonnie Raitt said “Life gets mighty precious when there’s less of it to waste.” She is an American blues singer-songwriter and slide guitar player. One of her great songs is “Let’s give them something to talk about.” Come down to the broad beautiful banks of Old Fox Creek and enjoy the conversations around the stove on these chilly mornings. You’ll be there with the movers and shakers (whittlers and spitters and yarn spinners) of Champion—Looking on the Bright Side!